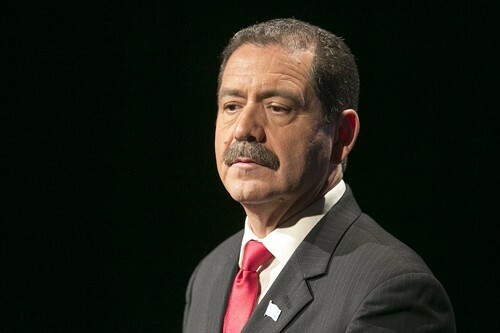 Chuy Garcia fielded questions about his son in the final debate. Journalists sometimes regret the questions they ask, but not very much. It's the questions they don't ask—or ask clumsily—that can bug them for years. Phil Ponce didn't apologize for the series of questions he asked Chuy Garcia about his wayward son during Tuesday's mayoral debate, though upon further reflection he told John Kass that one question "was off the mark." "I think we can all agree on how inappropriate this line of questioning was," Steve Rhodes said the next day on the Crain's Chicago Business website. Everybody doesn't agree—but plenty of people do. To sample some comments on Facebook: "This is out of character for [Ponce.]" "Totally off base." "He should be fired for the scum-bag tactics." "Journalists ask tough questions," Kass reminded his readers. But he allowed that "the tone was wrong" on one of Ponce's. That question: "A lot of voters might wonder, Commissioner . . . if you can't keep your own son out of a gang, how can you steer the city away from gangs and violence?" Let's get real. This brutal question is actually a lollipop. If Garcia hadn't been ready for it—if he'd raged or babbled—he'd have looked terrible; but of course he was ready. Garcia answered Ponce with love and dignity and was cheered. His opponent, Rahm Emanuel, broke in to say "I don't think this is a fair line of questioning" and won nobility points of his own. No one came off badly except Ponce, who couldn't have been surprised that that's how the moment turned out. When relentless questions make viewers (including me) uncomfortable, we turn against whoever's asking them. I was solidly on Garcia's side by the time Ponce got to the point he was aiming for. "One of Chicago's leading law firms, Mayer Brown, represented your son for free on a felony charge. Later, as a Cook County commissioner, you consponsored a measure to give Mayer Brown the job of handling a $100 million bond deal. Why is that not payback?" Garcia replied that he wasn't the one who hooked his son up with Mayer Brown, and that at the time he wasn't even on the Cook County Board. He didn't see a conflict of interest. The question was a fair one and Garcia came away from it smelling like a rose. Kass had complained about tone, but when he got specific about why the question bugged him, it wasn't tone he objected to but an uneven playing field. "If you're going to ask Garcia a tough question about his kid," Kass wrote, "then you probably should ask Rahm about his penchant for squeezing Chicagoans with those red light cameras of his. But I didn't hear any tough red light camera questions asked of Emanuel." Fair enough. But let me repeat: the tough questions about Garcia's kid did Garcia no damage at all. They were, in fact, very likely the only moments in the debate when everybody watching was on his side. It was much dodgier for Garcia when Ponce brought up the $650,000 deficit Garcia left behind when he resigned from Enlace, a southwest-side community organization he built and ran from 1999 until 2009. Garcia's reply has been that Enlace was hammered by the 2008 recession, that a deficit is not a debt, that he left Enlace in the black, and today it's bigger and healthier than ever. To be precise, said Emanuel, it was a $657,000 deficit. It's not my place to take sides here, but if, next time this comes up, Garcia points out that during Emanuel's own years learning the executive ropes, on the White House staffs of President Clinton and President Obama, the U.S. ran up deficits totaling approximately $3.3 trillion, reporters won't be ungrateful for this perspective.